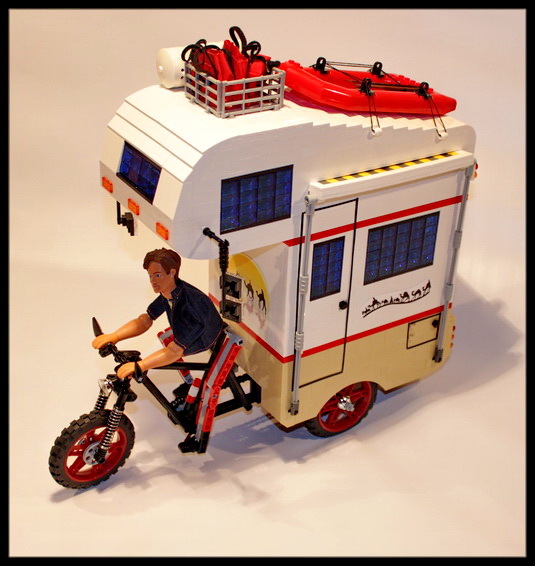 Serbian builder Milan (Ultimate-Design Bricks) wanted to create a build that combined his passions for bikes and camping. So when he discovered artist Kevin Cyr’s Camper Tricycle project, he knew that was what he wanted to recreate. Milan’s model is packed with details, and he provides a full breakdown on his website. The tricycle features front and back suspension, rear differential, 180 degree steering, working pedals and chain link drive. The camper has working doors, a retractable sunshade and a plethora of storage areas and personal effects.